Can this possible be as good as it sounds? Nothing ever sounds so good to me as coconut milk. I don’t know why this is, because every time I have some I’m inevitably disappointed. I blame cultural indoctrination for my consistently high hopes – mainly Sesame Street. As a child I remember watching one of the recurring animated segments that would run from time to time on that saintly old show, the simple story a little boy in Jamaica (or some such Carribean Island) who wants nothing but a nice glass of coconut milk before bed time, receives it, and becomes infinitely content. What was coconut milk, I wondered, watching this little drama unfold, and how good must it be? I supposed it to be something unearthly sweet and creamy and delicious. Alas, I grew older. And as I grew older it came to be that I would taste coconut milk. And through tasting it I came to know the bitter world of disappointment that comes to claim us all. 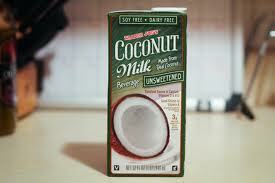 Coconut milk, I learned, basically tastes like water diluted with milk, nothing so exotic as I had dreamed. And so I turned my attention to other things, and experienced much and forgot coconut milk, forgot it until today. Trader’s Joe’s Unflavored Organic Coconut Milk Beverage lured me with that same exotic appeal from my youth, and while it does not redeem those lost childhood dreams, for what it is it is quite good. This coconut milk beverage, and note the addition of the word beverage here, is basically just a soy milk substitute. The taste is very close to the taste of ordinary soy milk (essentially undetectable to a regular guy like me), but is noticeably thicker and creamier, and leaves a mellow, lingering taste in the mouth. This creaminess is due to the ingredients behind the coconut milk beverage, which is not actually coconut milk per se, but coconut cream mixed with water. To me, this would seem to be basically the same thing as coconut milk, seeing as that coconut cream is just coconut milk that has had the water simmered out of it. Evidently that’s not the way the truth in labeling division of the US Gov’t sees it though. At any rate, the main audience for this product doesn’t seem to be me so much as it does those people whose stomach’s are quite prickly when it comes to milk and/or soy based products. I can’t speak for those fine people, but as someone blithely lactose tolerant I thought this product was a bit nicer than ordinary unflavored soy milk for my cereal, but still no replacement for the good ol’ cow. Would I Recommend It: Only to those on the look for something other than soy milk. Would I Buy It Again: Sorry, but it just doesn’t fill any needs in my life. Final Synopsis: A good go to for the soy-sensitive, it not the childhood dreamers. Much as I would love it to be, this item isn’t actually organic. 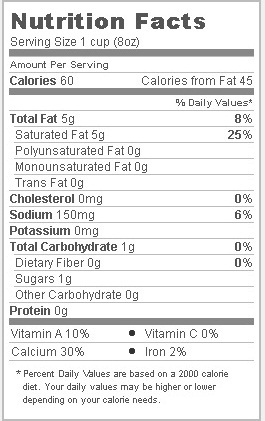 But I get it anyway because of the numerous health benefits of coconut. I cut it with organic rice milk. But if they ever offered organic coconut beverage, I would be all over that and drop the rice milk altogether!